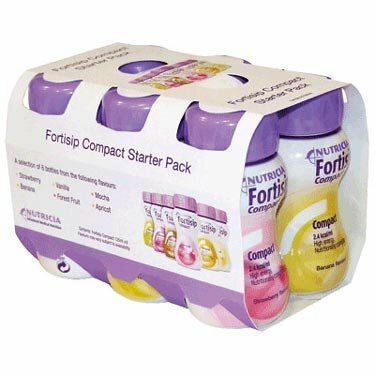 Fortisip Compact Fortisip Compact is a high energy, milk shake style supplement, for the management of disease related malnutrition. Fortisip Compact can be used to supplement the diet of patients unable to meet their nutritional requirements from other foods, or as a sole source of nutrition. Fortisip Compact is suitable for people with the following conditions: Alzheimer’s Disease, Cancer, Critical Care: Burns etc, Cystic Fibrosis, Dementia / Alzheimers, Diabetes, Leg Ulcers / Wound care, Malabsorption / Maldigestion, Malnutrition / Undernutrition, Neurological : Multiple Sclerosis etc., Parkinson’s Disease, Poor appetite / Anorexia, Respiratory Disease / COPD, Stroke / CVA, Swallowing Problems / Dysphagia, Weight Loss in Older Adults. Fortisip Compact is Gluten Free.